A business magnate calls on wine expert Benjamin Cooker to kickstart his new wine business in Beaujolais, sparking bitter rivalries. 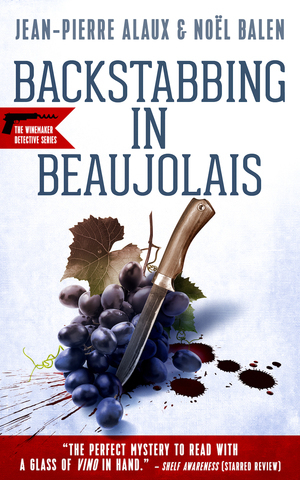 Can the Winemaker Detective and his assistant keep calculating real estate agents, taciturn winegrowers, dubious wine merchants and suspicious deaths from delaying delivery of the world-famous Beaujolais Nouveau? This is the 4th book I’ve read in this series and I loved it as much as the others. It’s a quick read that transports you to the wine country in France. As usual, the characters are well developed and I thought it had a nice even flow. There are roadblocks in the journey to get the wine business going, some of the townspeople don’t want them to succeed. There is a lot of drama and a murder, and it all makes this book worth the time spent reading it. This is the 9th book in the series but it can be read as a stand alone. If you like books that take place in France, about wine or murder, this is a book for you. while sharing a meal with a bottle of Château Gaudou 1996, a red wine from Cahors with smooth tannins and a balanced nose. Translator: Anne Trager loves France so much she has lived there for 27 years and just can’t seem to leave. What keeps her there is a uniquely French mix of pleasure seeking and creativity. Well, that and the wine. In 2011, she woke up one morning and said, “I just can’t stand it anymore. There are way too many good books being written in France not reaching a broader audience.” That’s when she founded Le French Book to translate some of those books into English. The company’s motto is “If we love it, we translate it,” and Anne loves crime fiction, mysteries and detective novels. Happy Monday! Vicki, thank you very much for hosting this terrific giveaway. I hope you (and your readers) will stop by my blog as I have finally posted a new review! The entire premise of the series is creative and neat. M<y wife loves both wine, wine culture as well as mysteries of this type so I will recommend this entire series to her. I haven’t attended to my Francophile side in quite some time. I am a fan of beaulojas too so thyou s may be a series I would like. I don’t tend to read too many ‘cozies’ and have certainly never grappled with a translated story – I’m wondering just how successful that is, although as you have read a few books in the series, I guess it works out quite well! I’m not too much of a French wine lover, or even red wine in general. We usually prefer the Australian or American Chardonnays, served icy chilled. I like to read about wine making. Would like to know what happened in this small town.